Neat set I picked up at a local estate sale. Appears un-used. Very cool set. Vintage Glass Coasters Set Of Six With Footed Goldtone Metal Caddy Holder . Condition is Used. Shipped with USPS Priority Mail. THE COASTERS ARE IN GOOD CONDITION . AND I HAVE SHOWN BACK AND FRONT OF COASTER. Loot Crate Marvel Gear Goods exclusive. 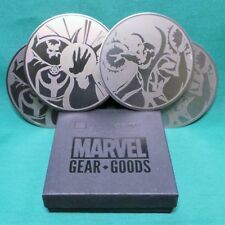 Doctor Strange Coaster Set. Laser engraved stainless steel coaster set of 4. Doctor Strange vs Boron Mordo. The Graduate Movie Clip Drinks Coaster. 9cm x 9cm Wipe Clean Front. Artisan Fobs & Magnets ( UK). AND MUCH MORE. KEYRINGS…MAGNETS…BOOKMARKS…COASTERS. Full cork backing to protect your furniture. Display stand included. Hand wash only. VINTAGE SILVER DOLLAR METAL COASTER SET OF 4 IN BOX 3” DIA. Set of 4 ivory capris shell scalloped coasters in nice pre-owned condition. 3" round coasters in never-used condition. Coasters have a slight raised edge. 1 PERSONALISED BATMAN DRINKS COASTER. COASTER IS A LITTLE BIGGER ALL ROUND AND MADE OF ACRYLIC. COASTER IS A LITTLE BIGGER ALL ROUND AND MADE OF ACRYLIC. Birra Moretti Coasters. Sealed bundler of 100 beer / drink coasters. Ronan Keating Coaster. The coaster is made in the UK from high quality acrylic and the insert (80 x 80 mm) is printed on glossy photo paper. All orders placed by. USA V-TWIN POWER rubber Coasters Set Of Four By Starwest Inc.
USA V-TWIN POWER rubber Coasters Set Of Four By Starwest Inc.. Condition is Used. Shipped with USPS First Class Package. Nice set of coasters molded of rubber, each the same. Red, white, orange and black. Keep your counters and tables protected with these durable coasters. made in the U.S.A. As always your satisfaction is our priority. We strive to provide exceptional service and appreciate your 5 star positive feedback. This is a 3.5" x 3.5", 1/16" thick, flexible, slip-resistant and durable, rubber coaster. Coasters are also are washable. Polyester with open cell black rubber backing. Coaster is made from hard wearing acrylic. Isle of Man glossy finishDrinks coaster with felt back - 90mm x 90mm. Pop Culture Smash. HD Quality. Washable & dishwasher safe, these coasters will put a new spin on protecting your furniture. Colors are Blue, Green, Red & Brown. 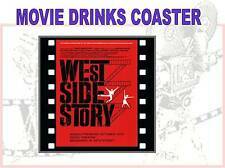 Every drink is a hit on a record coaster! If there are any problem with the item, it will be listed above. cocktailGlass Cover Set. I am reasonable and will work with you.